Today I bring you a quick little magical-Monday-speed-coloring of a critter picnic…enjoy! While today is a day many think of only picnicking – be sure you and your friends and family remember the real reason for the federal holiday in the United States….remembering those who made the ultimate sacrifice of their lives. There are families today remembering their fathers, mothers, sons, daughters, who are not there to enjoy a burger or a slice of pie; please keep them in your prayers. Auction WINNER! The highest bid was from Jo Ann & Dave Crain – congratulations! I’ll send you an email to connect. Thank you to everyone who put in bids! Below are links to the supplies I’ve used for today’s project; click on the listed items to go directly to it. Compensated affiliate links may used, which means if you make a purchase I receive a small commission at no extra cost to you. I truly appreciate your support toward the costs of running this blog! Read more. Your cherry pie looks so juicy and good! Great idea to grow out the tree house. The best part was your pause to honor the sacrifices people make for us in our armed services. Great video! This is just amazing Sandy. You have not only inspired me but my 4 y/o grandson. He loves to watch my card videos and after watching this he went right to his table to colour. When he was finished he excitedly wanted to show me how he had coloured a pic and that he coloured inside of the lines! Thanks for the continuing inspiration! I love your faith, whimsy and eye for detail. Thank you. I learned that I should resist the urge to completely cover the image with color. That little bit of white makes such a difference in those cherries! 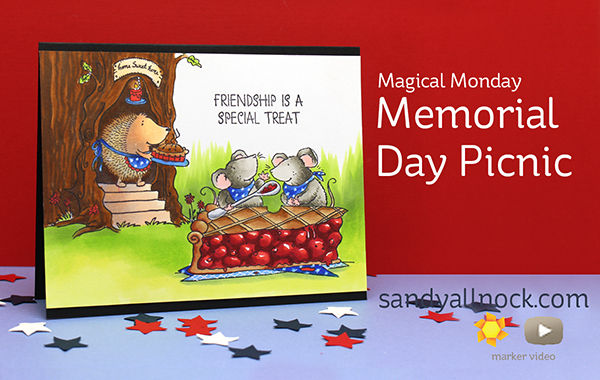 The card is perfect for today!… I love that cherry pie!! Hope you have a great day off. The coloring on that card is, as always, amazing. The cherries look good enough to eat. Thanks Sandy. Adorable card. And thanks for the reminder about the real meaning of today’s holiday, Memorial Day. Wasn’t intending on spending time on the computer today, but saw the email & just had to watch your video & am so glad I did. Watching the cherries and the tree develop was amazing, and I really appreciated your tribute. Happy Memorial Day. Why is it that Simon Says Stamp, and other seller sites run out of products so frequently? They know that when you, and other popular artists feature a stamp set, or other new product, that they are going to have a “run” on that product….so why not have more available? It is so annoying to have to be notified when they finally come back in…. They often have no idea what I’m featuring….this stamp is over at Ellen Hutson though 🙂 It’s a fall stamp, so there’s not many.